Dobson takes aim at Obama on his radio show. (CNN) - One of the country's leading evangelical leaders is accusing Barack Obama of deliberately distorting the Bible and taking a "fruitcake interpretation" of the U.S. Constitution. 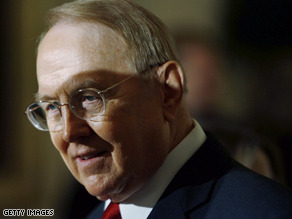 In comments aired on his radio show Tuesday, Focus on the Family founder James Dobson criticizes the presumptive Democratic presidential nominee for comments he made in a June 2006 speech to the liberal Christian group renewal. In the two-year old speech, Obama suggests it would be impractical to govern based solely on the word of the Bible, noting some passages suggest slavery is permissible and eating shellfish is disgraceful. "Which passages of scripture should guide our public policy?" Obama asks in the speech. "Should we go with Leviticus, which suggests slavery is okay and that eating shellfish is an abomination. Or we could go with Deuteronomy which suggests stoning your child if he strays from the faith or should we just stick to the Sermon on the Mount." "So before we get carried away, let's read our Bible now," Obama also said to cheers. "Folks haven't been reading their Bible." Watch: Can Obama court the Christian Right? On the radio show Tuesday, Dobson said Obama should not be referencing antiquated dietary codes and passages from the Old Testament that are no longer relevant to the teachings of the New Testament. Who cares about this clown, why is he making the news? Even evangelicals have turned their back on this man!